Who says President Obama doesn’t get endorsements from anyone other than his Hollywood buddies? 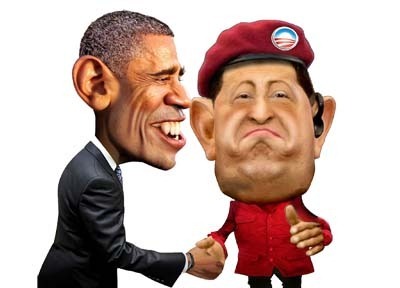 Just this week Obama secured the much prized endorsement of Venezuelan socialist dictator Hugo Chavez. Apparently poor rich guy Mitt Romney doesn’t fit into the mold of what Chavez thinks a U.S. president should be. Chavez faces his own, pardon the sarcasm, “re-election” in October; it’s quite certain it’ll be neck and neck, right up till the first vote is counted. Last Saturday night in a campaign speech Chavez compared his challenger, Henrique Capriles, with Romney, claiming both men represent the callously selfish capitalist elite. It must be a devastating blow to Mitt Romney to know that a socialist leader prefers Barack Obama to himself. Chavez said Capriles, a moderate former governor, is trying to pull the wool over the eyes of the Venezuelans pretending to actually care about the poor who Chavez considers his core constituency. “I believe the person to best explain the loser’s agenda isn’t Barack Obama but rather Romney, because it’s the extreme right-wing agenda that borders on the fascism of the United States,” Chavez said to tens of thousands of supporters in the crowd. 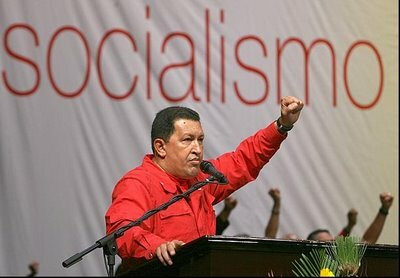 It makes one wonder whether Obama’s speech writers are moonlighting for Chavez. Their policies seem to have a lot in common and the rhetoric is in lock-step. Chavez claimed that the 220,000 families he says his government has provided with homes risk losing them if Capriles wins, while banks would make obtaining credit impossible for lower-income home buyers. Chavez also says Capriles would eliminate the social programs that have been a hallmark of his 13 years in office – a charge Capriles denies. How long before we see an image of Mr. Capriles wheeling Mama off the cliff? 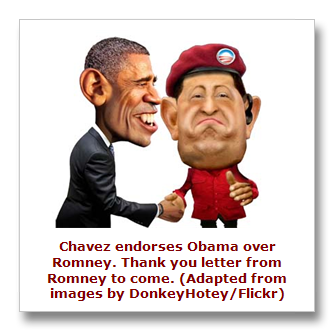 Chavez’s antipathy towards Romney ratcheted up after Romney’s speech criticizing Obama for his disregard of the threats to U.S. interests posed by Chavez’s deepening of ties with Iran. Romney responded by saying it was “simply naive” to think Chavez does not pose a threat to the United States. Obama’s apathy toward Chavez does come with its risks. Many Cuban-American despise Chavez for his close relationship to Fidel Castro. There are also a significant number of Venezuelan exiles concentrated in Florida, a state the president cannot afford to lose. The Obama Administration has been noticeably silent about their new supporter, Hugo Chavez; crickets can be heard chirping throughout the halls of the White House. Press Secretary Jay Carney responded to a single question about Chavez’s endorsement by stating he hadn’t read the article. The White House’s failure to respond is a missed opportunity for a man often painted by his political opponents as having socialistic tendencies. Chavez delivered Mr. Obama a softball and he whiffed on it. How many opportunities does Mr. Obama get to refute the support of a man who ranks high on American’s lists of most reviled foreign despots? Perhaps Mr. Obama finds Chavez’s support flattering? Who will be the next big endorsement for President Obama? Ahmadinejad? Bashar al-Assad? Kim Jong-un?